BUSINESS leaders have revealed they still have hope for the Jurassica project despite its unsuccessful Heritage Lottery Fund bid. The multimillion pound project, which aims to celebrate the geological heritage of the Jurassic Coast, has failed to secure a first round pass for funding. The Heritage Lottery Fund’s decision to award money elsewhere meant the project missed out on a development grant worth £500,000. This would have allowed the project to continue to apply for £16million worth of funding in 2016. The prehistoric visitor attraction, backed by Sir David Attenborough, is scheduled to open in Yeolands Quarry, Portland, in 2021. This date remains unchanged, despite the announcement, but the project is still estimated to cost in the region of £80m. Plans for the project include the recreation of a Jurassic shoreline named the Jurassic Cove. Animatronic marine reptiles and virtual technology have also been considered. Julie Cleaver, owner of Popcorn Marketing, said she was sure the project would find a way to succeed. She said: “Although we are all bitterly disappointed hearing the news that Jurassica is not included in this initial application to the Heritage Lottery Fund, I still believe that there is a huge about of support and goodwill being shown to the Jurassica project from local businesses, regional organisations and national companies. 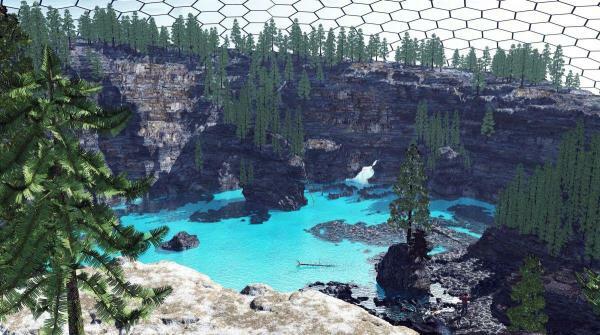 “The Jurassica project has injected hope, inspiration and motivation into the local community and I am sure that with the determination of the Jurassica team and the support behind the project, that Jurassica will find a way to succeed in the future. Emma Carter, meanwhile, from B+B Weymouth, said Jurassica was integral to the future development of Weymouth and Portland. She said: “On a practical business level, Jurassica will put Weymouth and Portland on the global map, driving tourism upwards and creating a much needed boost to this wonderful area. Catherine Brew, a partner at Red Plait Interpretation, on Portland, said the opportunities the project could provide were enormous. In addition to this support, the project has received backing from Richard Edmonds, earth science manager of the Jurassic Coast Team. Mr Edmonds said: “Jurassica has identified a key conservation World Heritage Site. Fossils for which the coast is famous for should be on display and secured for their scientific value. It is obvious that there is nowhere else along the coast that would be able to facilitate this.”Michael Hanlon, chief executive of Jurassica, said the project would carry on regardless. He said: “We are shocked and surprised to hear the decision made by the Heritage Lottery Fund in our bid for a world class attraction on the Jurassic Coast. My main concern is the residents and businesses of Weymouth and Portland who can see the enormous opportunity our scheme brings to them. It is critical the project proceeds for them. “It is highly telling that today’s extensive media coverage of a project which did not secure a round one pass, is greater than that of a project which did.